Last weekend and it was time for the Royal Ascot "Masters" event. 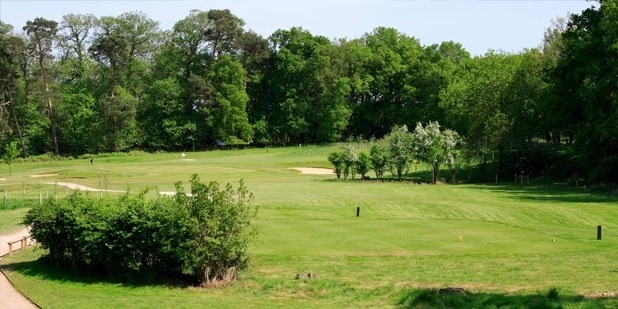 This is a thirty six hole medal event and is an invitational event open only to competition winners at the club over the preceding twelve months. I qualified courtesy of a win in the June 2015 stableford. I had a lesson with Andy Piper at Lavender Golf Centre in Ascot the Thursday before. It was an hour long split into two sessions, one of short game, mainly pitching with a little work from bunkers and the second half looking at the full swing. As always, the topic of conversation kept coming back to one word, "TEMPO." My initial pitching was flawed by a few set up issues but primarily I took the club away to quickly with the hands, and too far inside the line. It resulted in a few ugly shanks, never a good feeling or sight. Once I started using the arms and chest to turn better, I found ball striking was cleaner, certainly in terms of the depth of divot. It was also easier to control distance and trajectory. There was a secondary motive. By working on more of a one piece action for the pitching my teaching pro hoped this would bleed into the swing and make the takeaway for the full swing much smoother and with a better tempo. Indeed as we headed back to the teaching bay after nailing the pitching, he said he wanted me to spend hours just working on pitches and hit as many balls as possible, not only to improve that area, but to get that feeling of a smooth start to the swing and using the big muscles to control it. I'd been struggling with weak shots to the right, not a fade or slice per se but a shot starting right of target and continuing straight right but without the usual power and quality of strike. I showed Andy what I was doing. The good news was the posture is much improved with a nice straight back but it came back to the same issue. Too fast at the start and too much input from the hands. We worked on a smoother start akin to the pitching worked we'd just done. Suddenly it fell into place and tempo slowed, the swing was shorter and the ball striking was improved. I went away and spent Friday religiously working on my pitch shots and bunker play (which also necessitated this slower and better turn and tempo) and was happy when I eventually moved on to hitting fuller shots. All was set for a practice game on the Saturday before the big one on Sunday. My round on Saturday didn't work out as I hoped. It was full of wayward shots and I never really felt comfortable over the ball and was probably thinking too much about technique, tempo and a host of other things rather than letting it flow. I warmed up as normal prior to my first round in the Masters. I was worried that my pitching technique seemed to have deserted me. I hadn't pitched well in the previous day's round and I hoped it was a blip. Clearly not. However the tempo and takeaway on the full swing was holding together and I'd hit some nice balls warming up. I decided that I had nothing to lose. Medal play takes no prisoners and the game is in a state of flux so I just wanted to go out, play and not worry too much about the score although there was always that nagging voice at the back of the mind saying "don't make a fool of yourself". I decided not to worry about anything technical but to pick a target over every shot and picture Andy Piper behind me just saying "TEMPO" and feeling as though I was back on the range. The opening hole is a long par three coming in at 229 yards of the tips we were playing from. It was originally designed to be the tenth hole on the course but is now a stiff opener with out of bounds right, a line of trees some thirty yards short that eat in towards the fairway and green and with a pond short left. There are two bunkers left and one to the right. I struck the opening shot well but pushed it right towards the line of trees. It cleared them but I had no back swing on my second and could only move it forward a few yards. I pitched on and two putted for an ugly double bogey. Not the start I wanted but onwards and upwards. I steadied the ship over the next few holes and came to the fifth off the back of a couple of pars. I hit the fairway and although my approach missed the green left I should have been able to chip on, two putt and walk away. Instead I duffed the chip, opted to take the putter from the fringe grass and left the first putt woefully short and suddenly walked off with another double bogey. With another double coming at the shortest hole on the card, the 139 yard eighth, I was out in 44 shorts (+9 gross). The annoying thing was there had been some good shots in there and the focus and concentration for the majority of shots had been good and my tempo in particular was good, if anything a little too slow and deliberate in places. I needed to work hard on the back nine. I played some decent stuff but putts were agonisingly close, shaving the hole on occasions. I was holing well from the crucial two-three foot range but just couldn't make a putt from distance. I stood on the fourteenth tee at +12 and so all my shots were used with a tough finish to come. I found the fairway but had to fade it around a large tree on the corner of the dog leg. I moved it but it was short and right and I was left with a forty yard pitch. It should have been bread and butter as it felt as though that's all I'd done for two days but when I really needed to execute all I could do was scuttle it over the back and that was another double bogey. Still, it was still possible to post a reasonable score and perhaps hit the handicap buffer. I stood on the sixteenth in with a chance. I then hooked a tee shot out of bounds left. 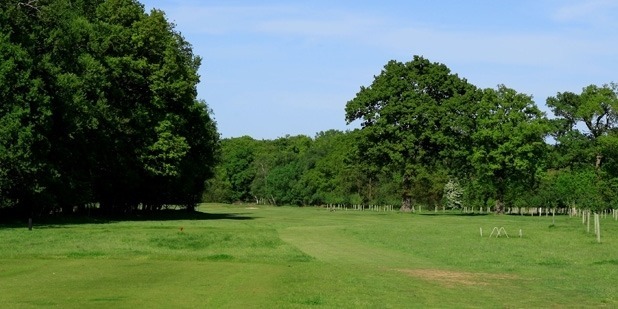 It is a tough driving hole as you can see in the picture below, the trees left (out of bounds) are adjacent for the length of the drive. I was forced to reload but repeated the error. Playing five off the tee I finally nailed a drive and followed it up with an excellent hybrid from 205 yards onto the green and I made par with the ball in play but it was a show stopping quadruple bogey eight. I've spoken about these show stoppers before. Stop me if this sounds familiar. As always, I had no idea it was coming and hadn't hit a single tee shot left off the tee all day. Not a sniff. These were straight left of the club face. In the end it all added up to a gross 89, less my 12 handicap and a net 77 (+7). Not what I had hoped for and if you looked at the score on its own you'd think it had been a real horror. However apart from some careless shots that led to silly a silly double bogey, I had been pleased with the quality of ball striking and in particular the tempo was very good. I had probably played myself out of contention but there was an afternoon round to be played and a chance for a degree of redemption. Any thoughts of redemption and a chance to right the wrongs were blown away from the start. In fact my scorecard resembled an overseas dialling code 7, 5, 7 (quadruple, par, triple bogey) and seven shots from my handicap allowance of twelve gone in twenty minutes of terrible golf. I really didn't feel comfortable and that feeling of calm I had taken with me in round one evaporated. I steadied the ship with a par at the fourth, but three putted the next. The flag was at the back and my ball finished at the front and I had three tiers on the green to contend with. I left the first woefully short. I dropped two more shots on the way to a nightmare 45 shots for the front nine (+10) and a shot worse than my morning effort. And then an outbreak of the golfer happened. I made five straight fours playing some tidy golf including a par at the hardest hole (SI 1) the twelfth. It did include dropped shots at two par threes and so by the fourteenth hole I had used my handicap allowance and there were still five holes to play. I made a great par at the fourteenth, courtesy of a lovely pitch from 45 yards to six feet. Perhaps the hard work was paying off. I dropped a careless shot at the next, three putting after a green in regulation but no matter, I was only one over handicap and the buffer zone beckoned. On to the sixteenth tee. On the plus side I was in the field so I had won in the past twelve months to qualify. Signs of improvement as I'd missed the previous two years. On the down side I got another 0.2 back on the handicap and teeter on the precipice of an increase to 13. Mind you the last time we were here I managed to get my win. Here's hoping lightening strikes twice. Bearing in mind I had tinkered with tempo and the swing a few days before the Masters and had played poorly on the Saturday, there was some good stuff. I think we can consign the nightmare of the sixteenth both times to the golfing room 101. There were some lazy double bogey holes, especially in the first round and on par three's in particular. However I thought the tempo was showing signs of moving forward although I can't explain where the horror start to the second round came from. It all sounds rather familiar doesn't it? A number of good holes blighted by two or three car crash holes. It's beginning to play on my mind and I need to stop the rot and stop it quickly. I don't know what the answer is yet and will be reporting back with the facts and figures from my endeavours to Andy Piper for a debrief and see if he can shed any light on the matter. I enjoyed playing in the Masters. It's been a while and I use to have a pretty consistent record of qualifying for it. Considering the toll the sixteenth hole took on my score in both rounds and the disgraceful start to the second, my twenty fifth place overall wasn't too bad. I did play some good golf but again, I seem to have spent a lot of the 2015 season saying that, and although there has been some success, it remains a season of huge frustration. I get the feeling that these posts have a familiar ring to them now. So how do I stop the bad holes when they aren't the same nemesis hole each time or the same type of errant shot? I'd love to hear from you, the patient reader, if you've had similar experiences and if so how you created a more bullet-proof game. I do feel the mind is strong and I utilise New Golf Thinking (What Is New Golf Thinking?) and I've read the stuff the likes of Bob Rotella have written. I have a pre-shot routine I stick to for every shot and over every putt, so it isn't as though I think I do anything different, especially under pressure. The bottom line as I see it is a two pronged one. Perhaps, and in my mind it's a big perhaps, I'm tinkering too much and still looking for what isn't there or isn't necessary with my game. As I've said before though, golf doesn't come naturally and I've always had to graft to get my game to any semblance of a good level and I'm an advocate of lessons to try and cut out the need for compensations in each swing and reduce the number of moving parts. The other issue, particularly in the summer, is that I need to just get out and play more, rather than honing the game in practice. It's perhaps too late in the year now (getting dark about 7.15pm) to do that but I would probably hold my hand up and say I've not played as much as I can. That could be key. Perhaps by being out on the course more, I'll develop more understanding on how to compile a score, even when rushing onto the course straight from a days work. Please feel free to comment and let me know if you agree, disagree or if you think I should be doing something different and there is a better way to stop the bad holes happening. As for now there's a medal to play and even though I stand on the precipice of an increase to a handicap of thirteen I'm looking forward to the challenge. I want to start the road to recovery sooner rather than later. As I've said, and stop me if this sounds familiar, I am hitting some good stuff in the practice. The short game is moving forward with pitching and bunker play starting to come to good. I need to do some work on the putting but on the whole it's pretty solid for my level of golf, and the work I am doing on tempo and the better takeaway is starting to feel more natural but does need constant attention. All in all, your narrator is frustrated but happy to have been in the event to start with. It's another step backwards in terms of handicap progression but I feel, no, I know, that a good score and a run of good scores is in there. I need to keep patient, keep plugging away and keep trying.